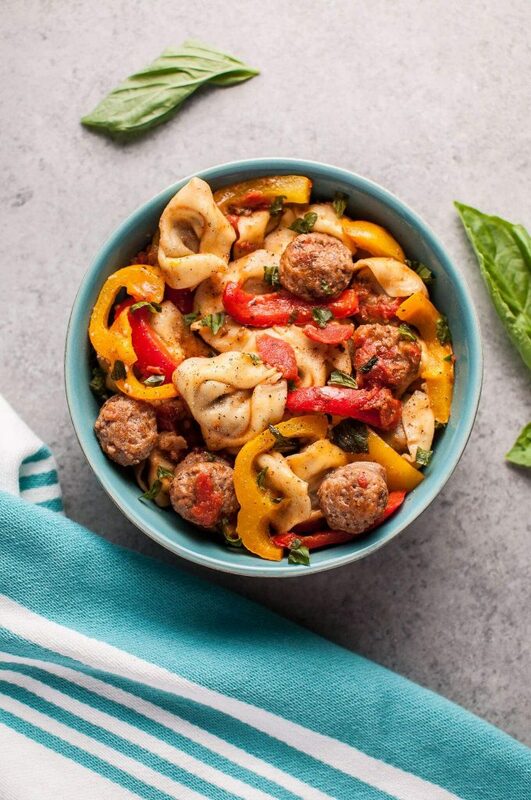 Tortellini with sausage and peppers – an easy way to make store-bought tortellini more exciting! Ready in only 30 minutes. I’ve been known to eat plain ole store bough tortellini by itself when I’m feeling super lazy. I don’t recommend it. It really doesn’t take much to turn it into something you actually want to eat. Fry up some Italian sausage and peppers, make a really simple tomato sauce, and cook it all in one pan. No fuss, and limited clean-up. 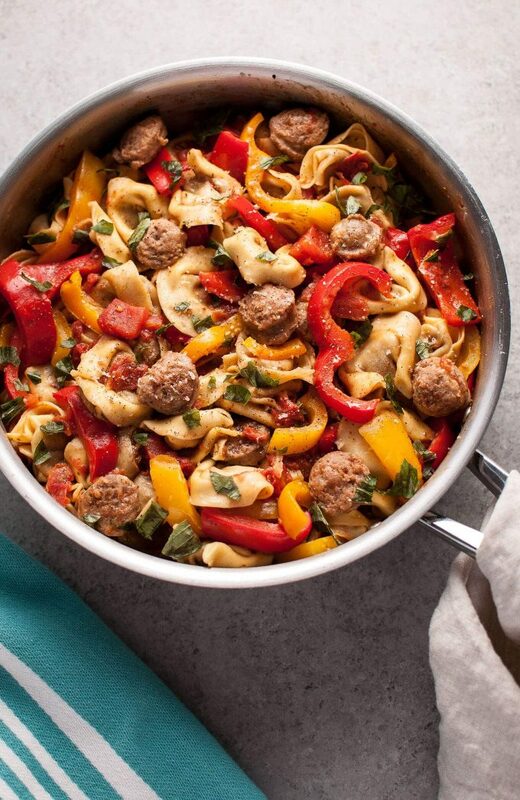 This sausage and peppers pasta is perfect for an easy weeknight meal! Normal people would use cheese tortellini for this, but I decided to use sausage stuffed tortellini, and then I added some extra sausage for good measure. Hope you will give this tortellini and sausage in a tomato sauce recipe a go! 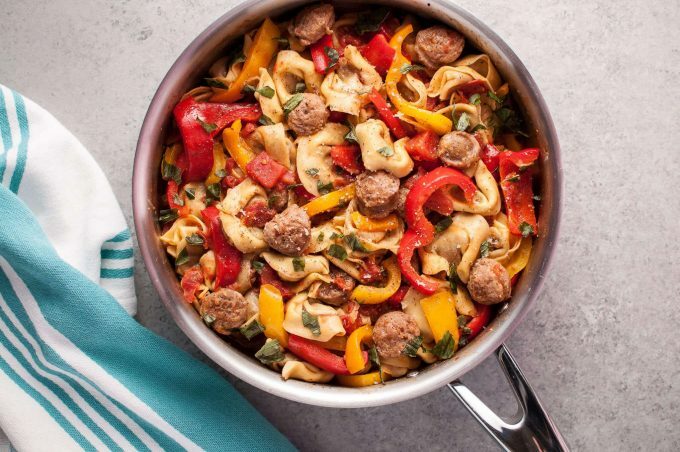 This sausage tortellini skillet with peppers is an easy way to make store-bought tortellini more exciting! Cook sausages for 7-10 minutes (or until browned all over) in a deep skillet on medium heat. Meanwhile, chop the peppers. Add the peppers to the skillet and cook for 5 minutes, stirring occasionally. Add the garlic and cook for 1 minute. Add the diced tomatoes, Italian seasoning, and water. Scrape the bottom of the pan. Add the tortellini to the pan and stir until it's mostly covered by the sauce. Cover the pan with the lid slightly ajar, and cook for 5-7 minutes, stirring once halfway through. Remove lid and cook for another 5 minutes or until the sauce is thickened as desired. Stir in the fresh basil and parmesan cheese. Serve immediately. Like this recipe? You may also like my one pot noodles with chorizo and peppers. always love your pasta recipes…you put the comfort in comfort food! Hi Natasha! Made this tortellini for my family tonight, and it was a huge hit! Even the pickiest eaters enjoyed it. We spiced it up with crushed red pepper and used leftover fettuccine noodles which still turned out very tasty. The fresh basil was the perfect addition. Thanks so much for sharing! So glad you guys enjoyed it!! ??? ?